“Comport or Compote … that is the question” (with apologies William Shakespeare!). Comports all in a row. ​Left to right: Persian Medallion (Fenton), Cherries (Millersburg, Wroda Auctions), Curved Star (Brockwitz), Imperial Grape (Imperial, Seeck Auctions). ​Language is dynamic and constantly changing, and the use of the words “comport” and “compote” are typical of that evolution. They mean the same thing and they evolved from very similar words comportier and compotier) which refer to a (usually) stemmed serving dish. ​A cookery book published in Philadelphia in 1844 describes putting a cherry compote into a compotier (shown right). ​Sowerby’s catalogues (from the 1800s), such as the one shown on the right, include fancy large comportiers and smaller comports. Put your cherry compote into a compotier (1844 cookery book). ​However, at some later point compotier became shortened to compote (despite the fact that compote meant stewed fruit), and both comport and compote entered the informal lexicon of glass terms. 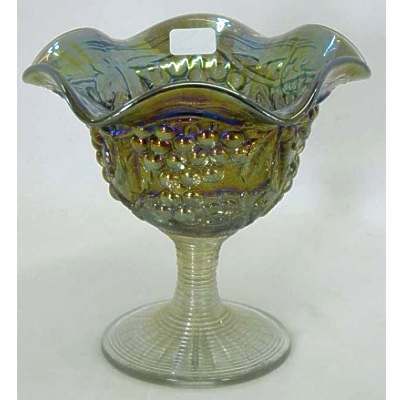 Glassmakers and advertisers used the term COMPORT in their ads for their iridescent (Carnival) glass back in the early 1900s. It is interesting that Fenton continually used the term COMPORT in their catalogues and ads into the 1990s and beyond. Some writers, such as Marion Hartung and Sherman Hand, used the evolved term COMPOTE. 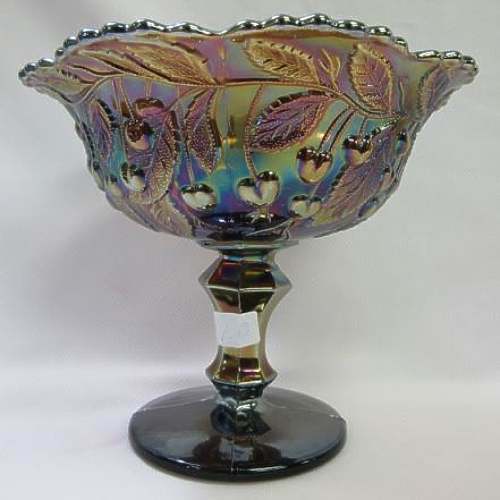 And curiously, in his writings on Fenton, William Heacock used the term COMPOTES when writing about items that Fenton themselves called COMPORTS in the illustrations Heacock was describing! 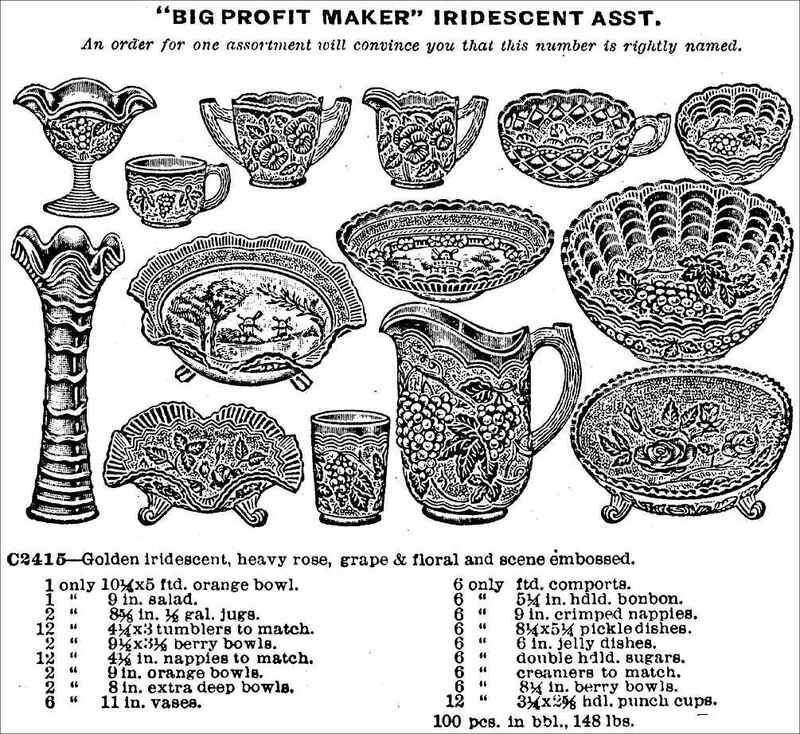 Above: a selection of Fenton comports on offer in Butler Brothers "Santa Claus" wholesale catalogue, 1910. Clockwise from top left: Iris, Vintage, Peacock Tail and Blackberry Bramble. Sowerby (England) catalogue from 1895 - Comport and Comportier. ​Personally, we like to use the term COMPORT because that’s what the Classic Carnival makers called the shape when they made them, and it’s what Fenton continued to call the shape. But both terms are appropriate – they are interchangeable. It’s like color/colour, catalog/catalogue, mold/mould. They are all part of the richness of our language. It’s all good. Vive la différence! Here are two other makers of Classic Carnival Glass whose ads in Butler Brothers used the term "comport". Below is an ad from 1912 for Northwood in which you can see their Fern comport (top row, second from the left) described as such. On the right is a 1915 ad for Imperial, which included their Grape comport (top row on the left). It's very interesting to see in both of these ads, the variety of descriptive terms that were used - all in order to induce retailers to buy! ​Fenton consistently used the term "comport". At the top of this article, we showed an early wholesale ad from 1910. 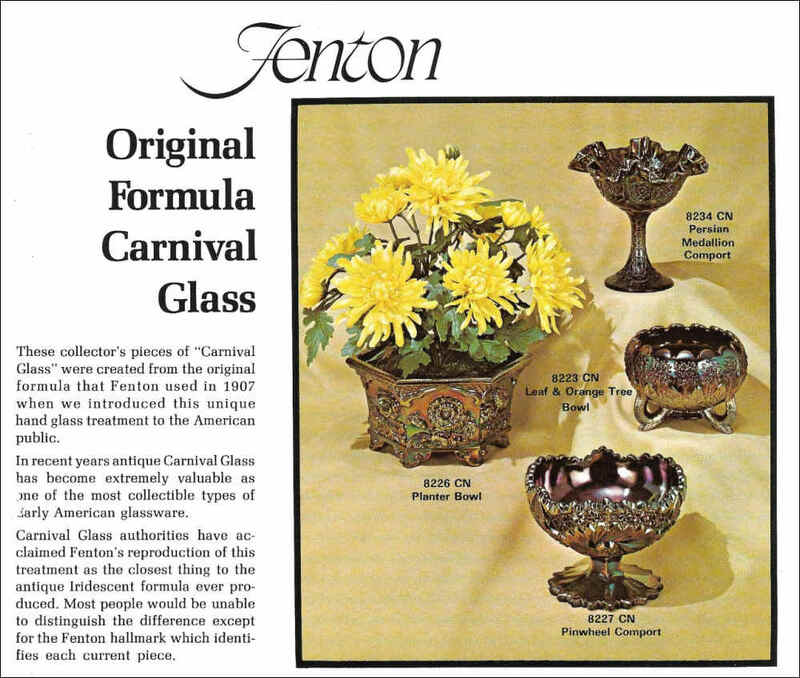 It was for Fenton's Carnival being offered in a Venetian Art Comport assortment, and on the right is another Fenton ad published more than 60 years later in the 1970s. 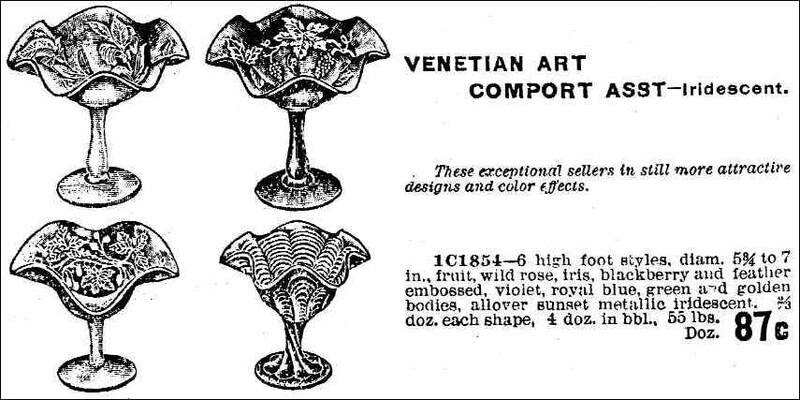 This ad was for their Contemporary Carnival Glass, and we can see Fenton's consistent use of "comport" for their Persian Medallion and Pinwheel Comports shown in this ad.